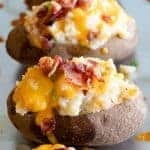 Twice Baked Potatoes! Basically mashed potatoes loaded up with cheese, bacon and green onion stuffed into a baked potato. This easy to put together side dish is sure to be a new favorite! Can be made ahead and baked fresh to serve with any meal. Clean the potatoes and scrub them to ensure that all dirt is removed. Dry with a towel. Poke a fork into each potato 3-4 times on the top to make enough holes for moisture to escape the potato while baking. Coat with oil and sprinkle with coarse salt. Lay on large baking sheet. Bake at 375 for 45-60 mins until softened, a fork inserted in the potato should go in smoothly. Remove the potatoes from the oven and allow them to cool for about 10 minutes, or until you can handle them safely. Cut the very top off the potato and using a spoon scrape out the potato, leave about a 1/8 inch layer in the potato skin to help it hold it’s shape. Place the potato that is scooped out into a large bowl. Continue until all the potatoes are done. Add the chopped up bacon, shredded cheese, diced green onion, sour cream, butter, salt, pepper and garlic powder to the bowl with the potatoes. Using a potato masher, mash the potatoes and mix together all of the ingredients. Add in the milk. Mix together. Mash to desired consistency. Taste the potatoes and adjust flavors and seasonings as needed. Add milk as needed to get desired texture. Sprinkle the tops with remaining shredded cheese, bacon bits, and chopped green onion. Place a small slice of butter on top of each potato. Broil for 5-10 minutes. Keep an eye on the potatoes, the cheese will melt, start to bubble and will start to brown. That is when you want to remove them. Remove the potatoes from the oven and allow them to cool for a couple minutes. Serve warm and enjoy!